If you play DVDs on your computer, you may notice that if you play a different region DVD, the computer may prompt you saying the region of the DVD is different, and whether you want to change the region of your drive to match. In some cases you only have a limited number of times you can change the region before the DVD drive is locked to that region. If the number of times is limited, then it is most likely that the hardware itself (the DVD drive firmware) is checking the region and checking the number of times you’ve changed the region. This type of firmware is known as RPC-2. Nearly all new DVD-ROM drives are RPC-2. If it’s not RPC-2, then your drive is known as RPC-1, which means that the actual hardware isn’t doing any checking at all, but software or the Operating System (eg. Windows) is checking the region. So what’s my problem? Well, I have a large number of Region 1 DVDs that I bought from US stores many years ago over the internet. Trouble is, if I watched them, then watched Australian DVDs on my MacBook Pro, I’m very quickly going to run over the 4 region changes I had left. Buy an external drive for the other region. Costs more money and means you’ve got another device hanging off your computer. Patch your drive to an RPC-1 firmware if available. Some clever people have “hacked” the RPC-2 firmware for a drive to an RPC-1 firmware. However, not all drives have been done, so this may not be an available option for you. Flashing your drive is risky, voids your warranty, and if something goes wrong, there is a possibility that you will render your drive useless. Also, having an RPC-1 drive means that your software may still be checking regions, which means you may need to run a software utility to reset the region. Patch your drive to an RPC-2 auto reset firmware. The next best thing is an Auto Reset patch. What this means is that your drive is still RPC-2 (the hardware will still check the region and you have 4-5 times to change the region), but every time you reboot your computer, the count and region will reset to whatever you had it when you patched your drive. 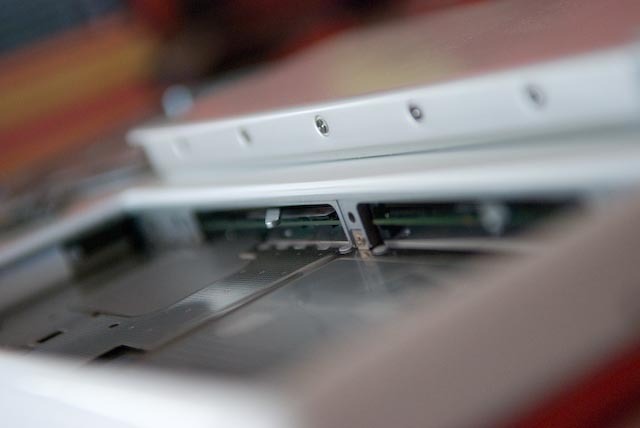 Patching your drive is risky, voids your warranty, and if something goes wrong, there is a possibility that you will render your drive useless. Also, I’ve read that the memory on your drive may only support a number of region changes until it gets “damaged”. Run a DVD viewing program or DVD-ROM utility that can get around the region encoding. I don’t know how these work, but I’m guessing they read the raw DVD-ROM data and then pretend to be a DVD-ROM in another region on the fly so you never have to change the region of your hardware. Rip the DVD movies and convert them into another format using software like Handbrake or MacTheRipper. This works because Mac OS is still able to read the DVD as a DVD-ROM disc and show the individual files on there as if it was a data disc. Since the computer has not got to the stage of trying to interpret the files on the disc and playing the movie, the region checking hasn’t kicked in yet. However, this method is obviously slow and not useful if you want to bring a stack of DVDs on a trip with you. I’m also doubtful of the legality of this option. As I have quite a few Region 1 DVDs, and my drive doesn’t seem to have an available RPC-1 patch, I tried patching my drive with an RPC-2 Auto Reset patch. 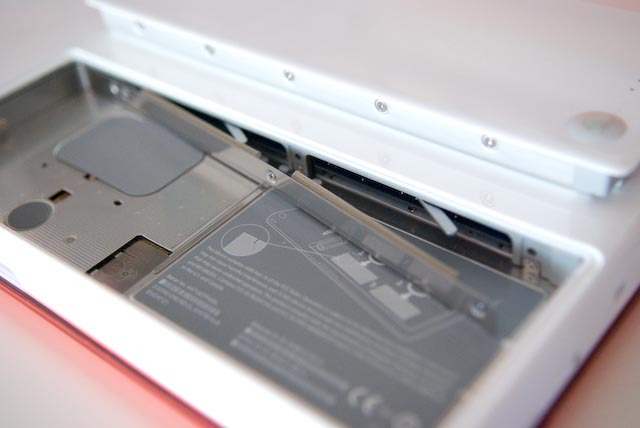 I worked out that my MacBook Pro has an LG DVD-ROM GS23N drive with firmware model SB00-01. DO NOT follow the instructions below if your computer and drive don’t match this. However, you may be interested in reading the steps aas they may be similar to the procedure you’d need to carry out on other computers/drives. Unfortunately, the patching software needs to be run in Windows, so the first thing I did was install a trial version of VMWare Fusion and install Windows inside it. Now, to test it out, I used DVD Info X to verify that my drive was in Region 4 with 4 region changes left. Then I inserted a Region 1 DVD and used the in built Mac DVD Player. The dialog box came up asking me if I want to change the region. However, after a reboot, all was back to normal. On the weekend, I decided to get a game going on the Mac. One game that my old laptop couldn’t play properly was Portal. The on board laptop video card was just not up to it. Now that I have a MacBook Pro with an Nvidia chipset, I was all ready! But how do you get games to run on a Mac? The games that I own and want to play are all Windows based. I really wanted to try not to install Windows. And Portal hasn’t been ported to the Mac yet. So, that left me option 3. 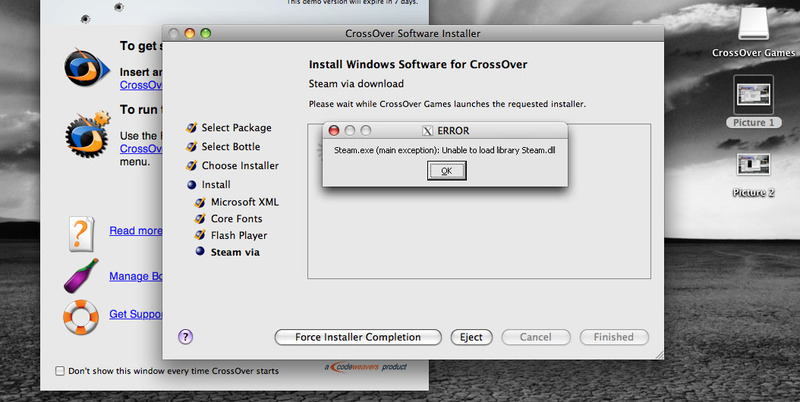 CrossOver Games is a program for the Mac that pretends to be the Windows operating system so that Windows games can try to run. Obviously, it is immense task to pretend to be an entire Operating System with all its quirks, so it happens that only some games have been qualified to run properly on CrossOver Games. Luckily, some of the Steam engine games like Portal are on the list! Installation was pretty straightforward. 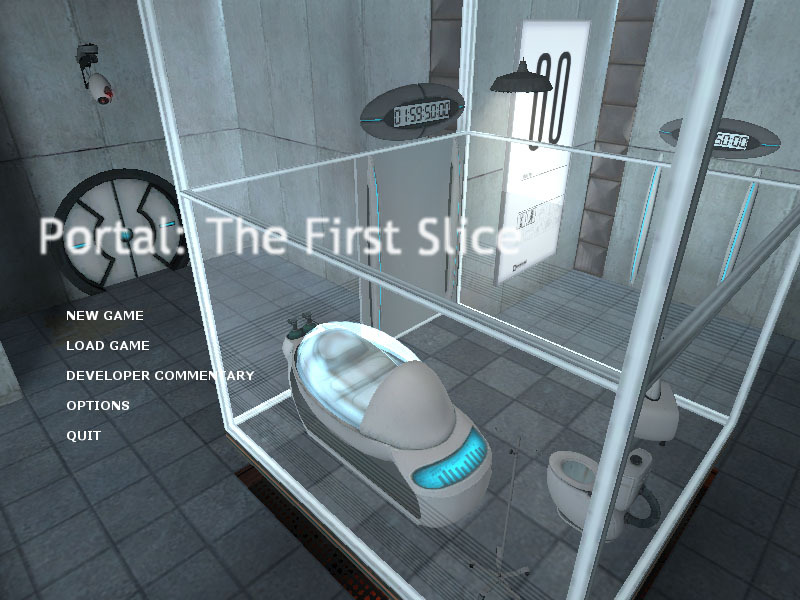 I decided to install the Steam engine and grab the demo version of Portal. 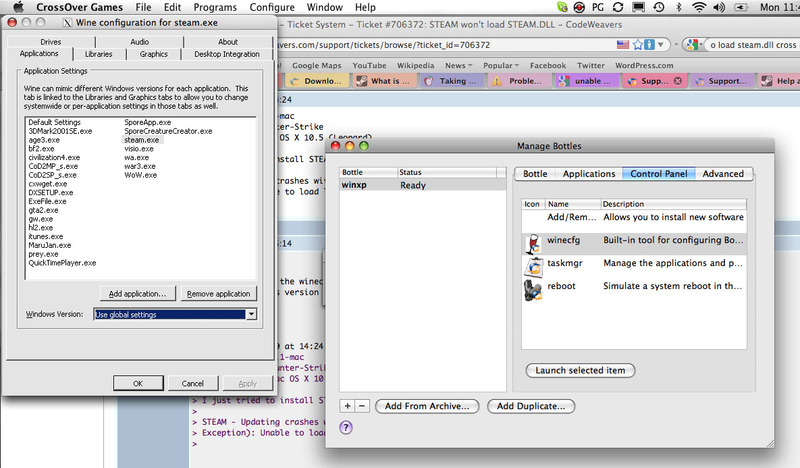 After mounting the CrossOver Games application, I proceeded to install the Steam engine using the wizard. It was really weird to see Windows components like MSXML install, seemingly on the Mac, but they were really being installed on a cut down version of Windows in something called a “bottle”. Unfortunately I did run into a problem during the Steam installation process with the error, “Unable to load library: Steam.dll”. A bit of Googling later and I found someone recommend that you check that the Windows emulation mode is set to Windows XP. I restarted the Steam engine installation, asked the Windows installation to “Repair”, and then it all worked. After choosing to install Portal, it all started up magically and worked fine! The framerate was fine, but the screen looked like the vertical sync was not on because there was tearing. I’m sure this can be fixed somehow. In the end I was very happy with the experience and will hand over some dosh to buy CrossOver Games and Portal! Now to install Guild Wars and see how that runs. I spent a lot of time last week finding equivalent software on the Mac for the ones I used to use on Windows. Having children means having a lot of kids DVDs that get played very often. We’ve unfortunately had a few DVDs get scratched by the kids and so I started backing them up, to be played through my PS3. In Windows, I used a combination of DVD Decrypter, Ripit4Me and then AVS or DVDShrink to backup my home DVDs. I wanted something simple to use that could encode in xvid with reasonable quality. Some of my DVDs were purchased from the US, so ability to rip DVDs of other regions is important too. Unfortunately, it seems that the range of DVD ripping utilities is less on the Mac. I’m currently experimenting with Rip It and Handbrake. Handbrake seems pretty good and one test run I did with the PS3 template worked without any problems. Music plays a huge part of my life, and being a Swing DJ, easy and fast access to any track part of my collection is essential. In Windows, I used the tried and tested EAC + LAME combination. This combination would be able to grab track names off the internet, securely rip my CDs and then encode them in the best MP3 settings. Since I playback my music on my iPhone and iPod, and most of my Swing music is scratchy old 1930s-50s stuff, I am not too concerned about lossless. So what do people on the Mac use? iTunes seems the “standard”, but unfortunately that doesn’t have secure ripping or use LAME. After some searching, I’ve settled on using XLD which uses the LAME engine for MP3 encoding. It seems to still have actively development, it has advanced ripping and can encode in a variety of formats. If you watch any movies or TV shows on your Windows computer, you probably have heard of the K-Lite Codec Pack. It’s the best way to make sure your computer has all the necessary files to play back any video files. It also includes the advanced Media Player Classic. Is there an equivalent on the Mac? The Quicktime Player seems to be the standard Mac video player. So if we stick with that, how about the codecs? The general consensus is that all you need is Perian and the Windows Media Components for QuickTime. This should let you playback most videos. I recently switched from Outlook Express to Thunderbird on Windows. Fortunately, this made the switch to Mac really easy, as there is Thunderbird on the Mac too. I’m still toying with switching to use Apple’s OSX Mail program as it has seemless integration with the OSX Address Book. Unfortunately, I can’t get Google Contact syncing working at the moment with it. Macs come with Safari out of the box of course. But Firefox is my browser of choice. Being available on both Windows and Mac made my switch very easy. I’ve recently been experimenting with BreezeSys Downloader Pro. I love being able to control the exact naming scheme for the folders and photo files that I’m downloading from my camera. Unfortunately, this software isn’t available on the Mac, but I’ve since found that many of the commercial photo editing products out there already have this functionality built in! I’ve been living in the dark ages! To manage all my MP3s on Windows, I’ve been using MediaMonkey. It’s an excellent piece of software and can handle and manage large MP3 collections with ease. When DJ’ing at Swing Dancing functions, I use 2 instances of Foobar2000 with their outputs set to different sound devices. This lets me monitor/audition on one, whilst playing back on another. The bad news for me is that neither of these 2 MP3 programs are available on the Mac. Yes there is iTunes – but it’s fairly limited in terms of MP3 file management, and on the Mac, you can’t even have 2 instances with 2 different outputs! I’m trying to resist VERY hard the temptation to install Windows and run these programs, either through BootCamp or on a virtual machine. Surely there has to be something else on the Mac? I’ve started reading up about Traktor but it seems overkill for what I need to do. On a good note, I have my Airport Express working again! After all the problems I was having on my Dell laptop, iTunes is streaming music wirelessly from the MacBook Pro to my stereo! Office Suite – When I bought my MacBook Pro, I also purchased the AppleCare Protection Plan for extended warranty. Luckily there was a deal to get Microsoft Office 2008 for free with this! This has solved my Office suite problems! Although, I might retry OpenOffice on the Mac as I had been using this on my Windows laptop for a while. 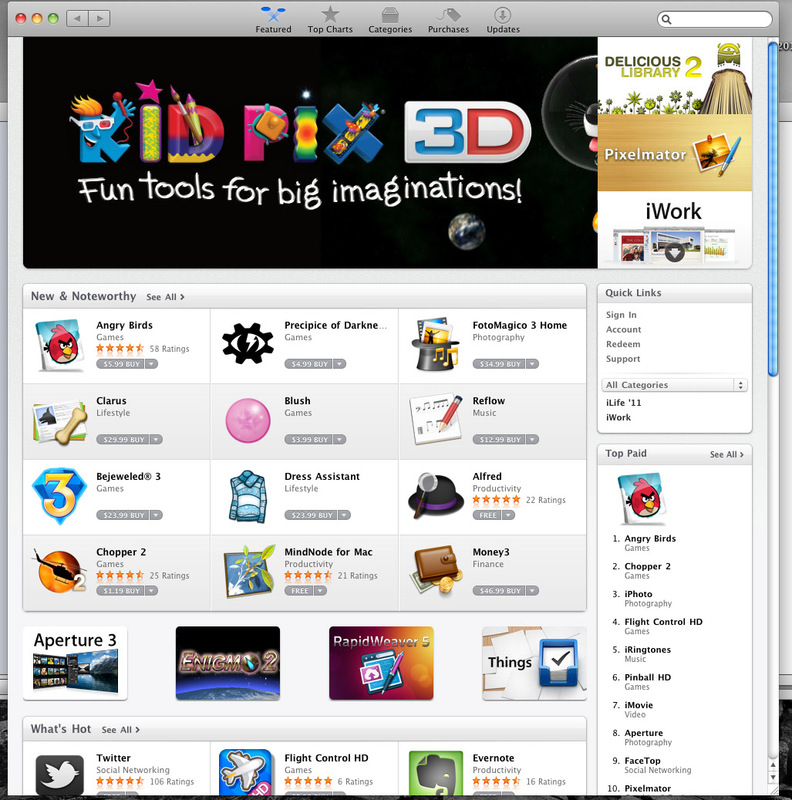 Skype – It’s available on the Mac! TweetDeck – Also available on the Mac! I know there are other alternatives, but I hope this list might help others who make the switch. Wifey has been complaining that her MacBook is realllllly slow. Slow to load Firefox, slow to start iPhoto, slow to start mail. I decided to have a look at it the other day and noticed it only had 1GB of RAM. That’s not much at all… espeically when I see that she has many applications all running at the same time (often without realising it!). Last weekend, I googled around to find out how to upgrade the RAM. The Apple site has pretty clear instructions, so it was just a matter of buying the right type of RAM. 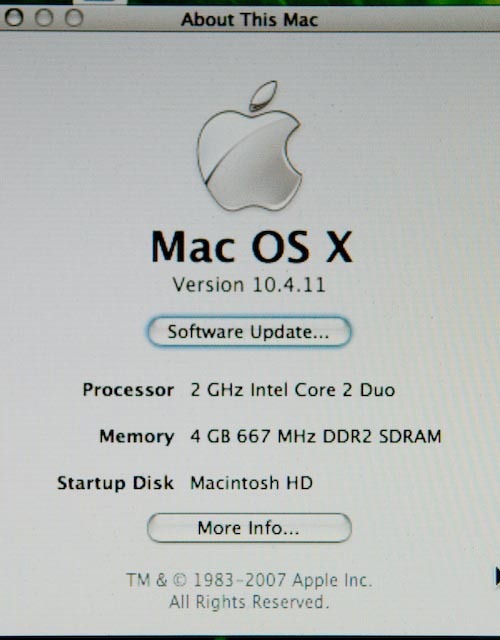 For her MacBook, the type to get is DDR2 667MHz SO-DIMM (PC2-5300). 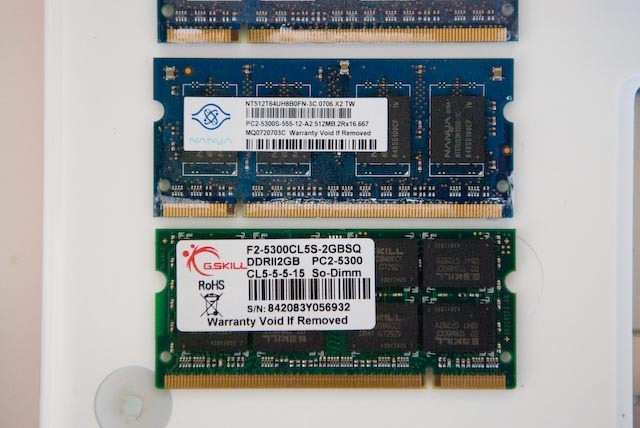 I decided to try buying RAM from the new MSY store in Balcatta. The store looks small, but they seem to have quite a lot of stock. The first thing that struck me as I walked in was how they had roped off multiple queues to the front counter – it must get pretty busy in there! The staff were really friendly and helpful. Unfortunately they were out of 2GB Kingston and Corsair sticks that I was after, but I was shown 3 other brands that they did have in stock, and I bought G.Skill in the end. 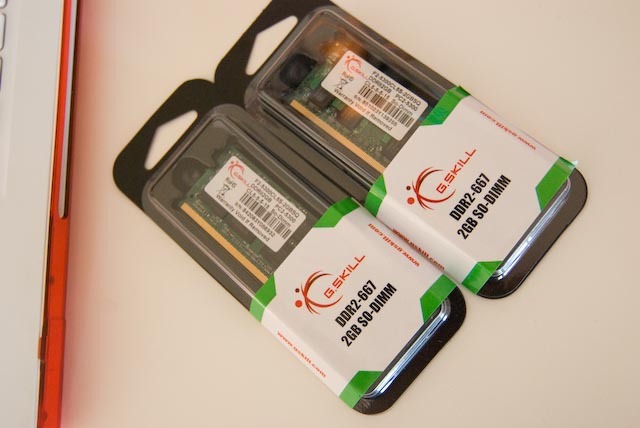 Each 2GB stick was $45, so the 4GB RAM upgrade came up to only $90 in the end! To install the RAM, I basically just followed the clear instructions found on the Apple site. Apple have really designed their MacBooks well. All I needed was a coin (or flathead screwdriver) to unlock the battery, and then a small Philips screwdriver to remove 3 screws, and that’s it! 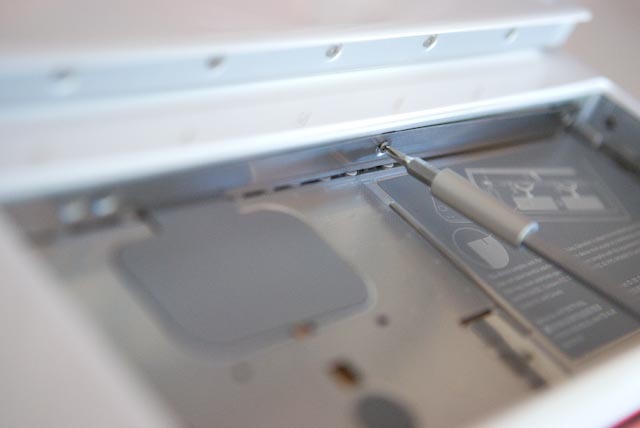 Removing the existing RAM is very easy by pushing the levers in the MacBook. 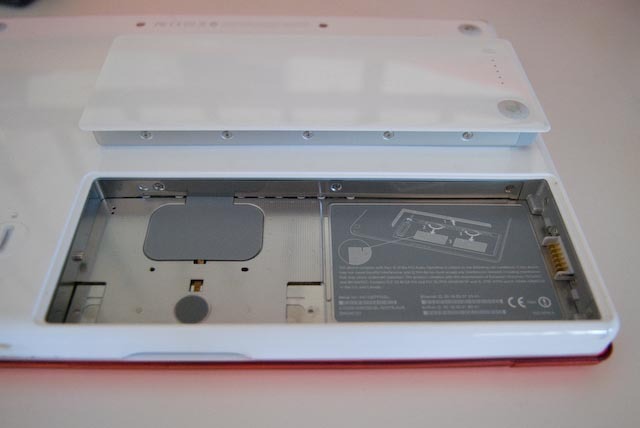 My only tip is – when putting in the new RAM, once you push it in gently, give it an extra push until the top of the RAM sits flush with the casing. Wifey already has noticed a speed improvement when using multiple applications. All good!